Did you ever watch the Seven Seconds or Less–era Phoenix Suns and think, Man, this is great, but I sure wish there were twice as many people playing right now? After yet another beautiful, Steve Nash–orchestrated fast break, did you wonder, Gee, how would this look if they were playing on grass and using their feet? Well, if you did, you probably have exceedingly specific tastes in sports, but you also happen to be in luck. This season, Liverpool have become as faithful a re-creation of those Suns teams as cross-sports comparisons will allow. Pair of dynamic scoring forwards? Check. Veteran creator and long-distance shooter with questionable defensive abilities running the team? Check. Entertaining, fast-paced style? Check. Coach with annoying verbal tics masking the fact that he may actually know what he’s doing? Check. The potential for stylistic limitations to restrict what they can achieve? There’s a checkmark there, too. The defining characteristic of those Suns teams was the speed at which they played. Get the ball up the court quickly — the best shot is the first shot — and, crucially, entice your opponents to do the same thing. We’re better at scoring than you, so let’s engineer games where we both try to score a lot. The same is true for Liverpool. Reds games average a combined total of 26.8 shots between Liverpool and their opponents, more than any other team in the league (stats courtesy of ESPN Stats & Info). And Liverpool lead the league in goals scored, with 73 goals. That’s entertainment. But it’s more than just the numbers — it’s the ethos. Most teams, even those that like to play at a fast pace, take time to gather themselves as they transition from defense to attack. Like the Suns in their heyday, Liverpool have completely removed that hesitation. If one thing stands out while watching the old Suns teams, it’s the speed with which they got down the court. Liverpool do the same thing. Football clubs frequently get criticized for playing a high defensive line against Liverpool, allowing Daniel Sturridge and Luis Suárez to run in behind the defense. But the truth is, a lot of the time, that line is only high because half a second before, the opposing team had possession. Liverpool are just better at transitioning from defense to offense than their opponents are from offense to defense. They did it against Swansea. They did it against Fulham. And they did it repeatedly against Arsenal, Everton, and Tottenham. Watching Sturridge and Suárez streak down the pitch, getting on the end of precise distribution from Steven Gerrard, conjures visions of Amar’e Stoudemire and Shawn Marion filling the lane as Steve Nash worked his magic. But it’s not only the one-to-one player comparisons that fit, it’s also how both teams made and make awkward lineup choices to facilitate their offenses. 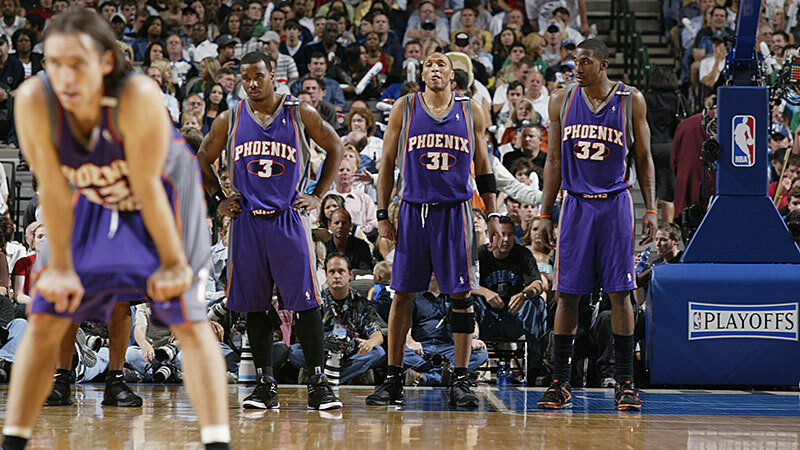 The 2004-05 Suns played Stoudemire at center and Marion at power forward, to accommodate Nash along with two wing players (Joe Johnson and Quentin Richardson). This lineup was a truly wondrous offensive machine. Things got tough when Phoenix wasn’t able to play its preferred style, but for the most part, coach Mike D’Antoni fashioned a system that allowed him to use his best offensive players. Brendan Rodgers is doing something similar on Merseyside. He plays his best attacking talent, even if it creates problems for his defense. Raheem Sterling joins Suárez and Sturridge to make a front three. Most three-man attacking units are made of one striker and two wingers, or (more rarely) two strikers with a playmaker behind them. Rodgers plays two strikers (Suárez and Sturridge) and a pure winger (Sterling). It’s unconventional, but it works beautifully. 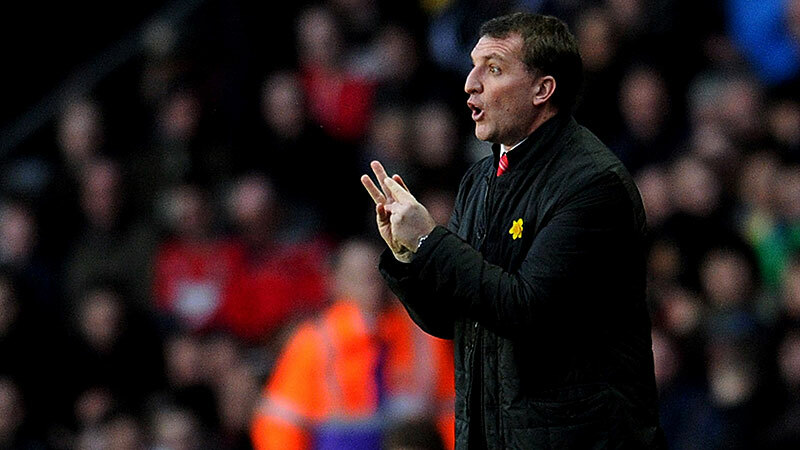 When it comes to the midfield, Rodgers also forces square pegs into round holes. Out of Jordan Henderson, Philippe Coutinho, and Gerrard, only Henderson is truly suited for the role he’s being asked to play. Coutinho is a creative waif who excels at picking out a pass to spring an attack. But he is not a two-way player, even though he gamely tries. This poses a problem because Gerrard, still adapting to being the sole deep-lying midfielder, could probably use some defensive cover. When Liverpool are cranking, this midfield lineup seems inspired, but if they’re off their game, Gerrard, and the back four, can be exposed. That Suns team never won the NBA championship, or made the Finals. One reason is, Phoenix had to face lots of other good teams in a playoff system. (The Suns had the best record in 2004-05, which would have won them the league title … if the NBA used the Premier League’s title-deciding system.) It’s tempting to attribute those postseason failures to Phoenix’s defensive frailty. But that’s not really true. On a per-possession basis, the Suns were actually a perfectly average, though not great, defensive squad. When they struggled it was because, stylistically, teams were able to take them out of their game. In the playoffs, the Spurs (San Antonio, not the Tottenham variety) in particular were able to slow the game down, blunting Phoenix’s attacking edge. Mismatches that worked in D’Antoni’s favor on one end of the court hurt him on the other. The Suns were felled by elite teams. Liverpool, however, have problems with more pedestrian opposition. It’s telling that the best Reds performances have come against good teams trying to attack. Liverpool’s transition has found space to work against sides like Arsenal and Tottenham. It’s the teams with less ambition, the sides happy to play conservatively, that have had more success. In Liverpool’s last four games against teams in the bottom half of the table, they’ve given up three goals to Swansea, two to Fulham in victories, and one to West Bromwich Albion and two to Aston Villa in disappointing draws. Teams shouldn’t be able to play conservatively and score goals against Liverpool, and that they can, and have, may be a sign that the team has not comparatively reached the same heights as the Suns.